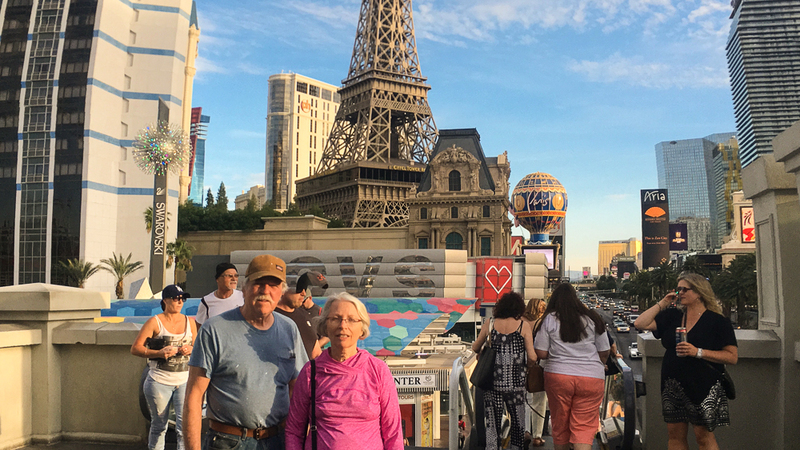 Mr. Fool’s parents came to visit from Pennsylvania and wanted to get a taste of the Old West. 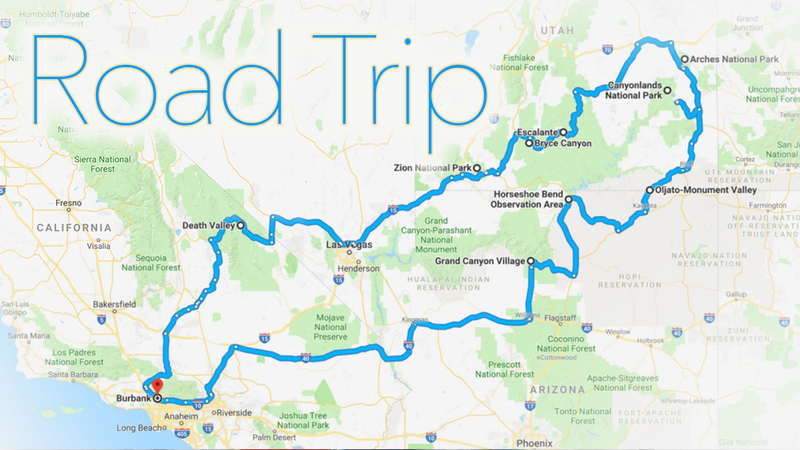 So we took them on a whirlwind four-night, five-day road trip that hit almost every major park in the southwest. 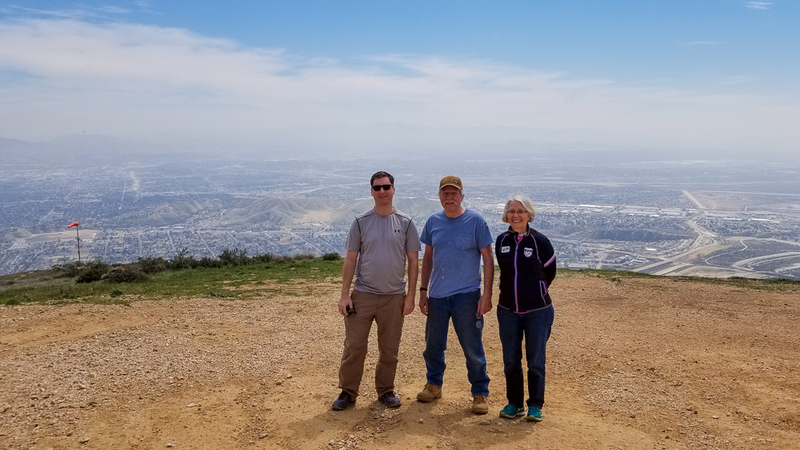 But before jetting away from our beloved SoCal, we took them on their first-ever tandem paragliding flights. Click here to see that adventure! At the top of Marshall Peak, ready to tandem paraglide. On the first day of our road trip, we headed north to Death Valley. 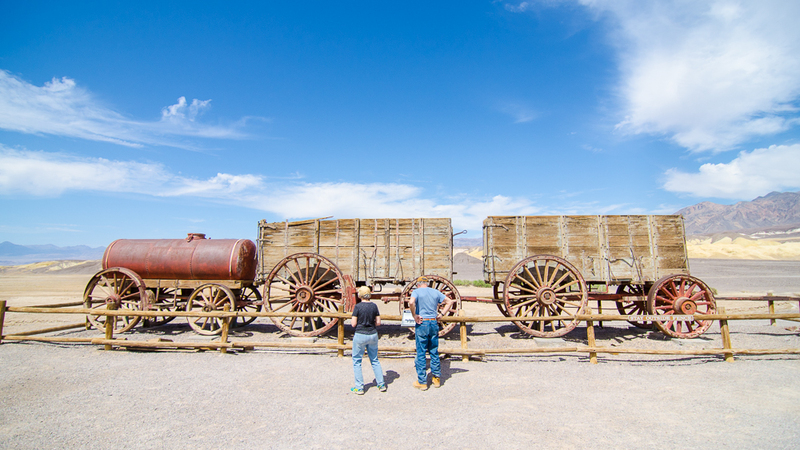 We drove the 190 though the park, stopping at overlooks and walking though the Mesquite Flat sand dunes and the Harmony Borax Works old camp. The conditions were so rough when we were there, we couldn’t imagine laboring in the heat during the 1880s. From there, it was on to Las Vegas. We walked the Strip and Miracle Mile, ate dinner, and zoomed off to our final destination of the day: the little town of Hurricane, Utah. Picture time at a gas station outside Death Valley. We did not hike the ridge to the tip, instead turning around at the section just before the chains. Resting at the top of the first set of switchbacks. 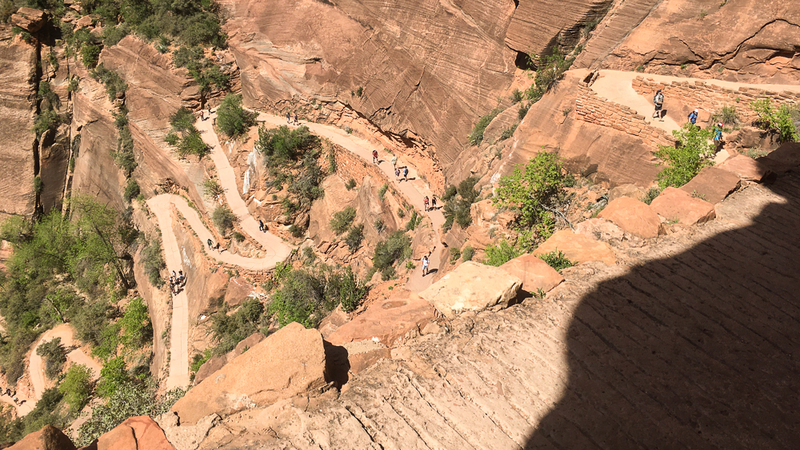 Angels Landing. 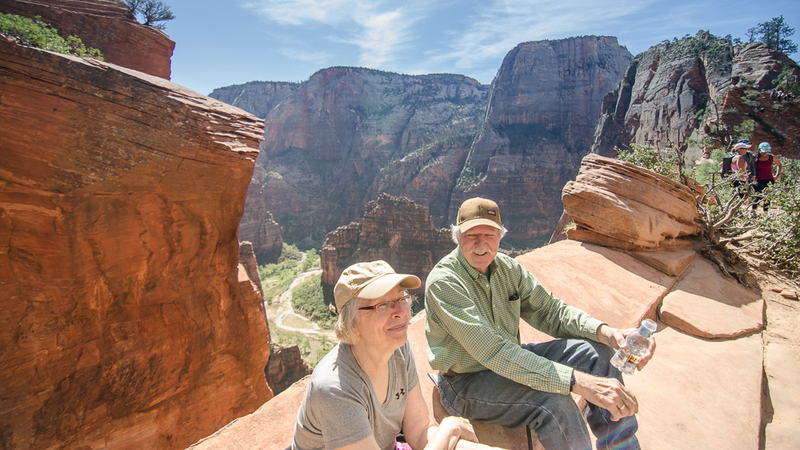 Resting at the top of Angels Landing before heading back down. 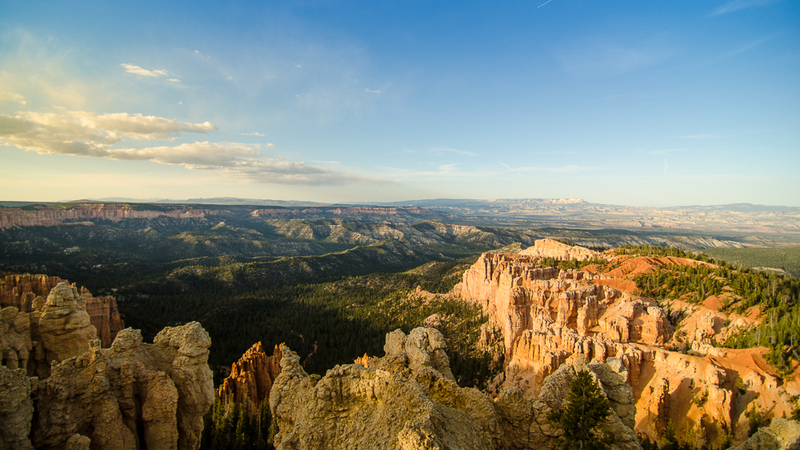 After finishing Angels Landing, we drove though the park and then up the 89 to Bryce Canyon National Park. We arrived with plenty of daylight left, so we drove all the way out to the end to watch the sunset, stopping at lookouts along the way. 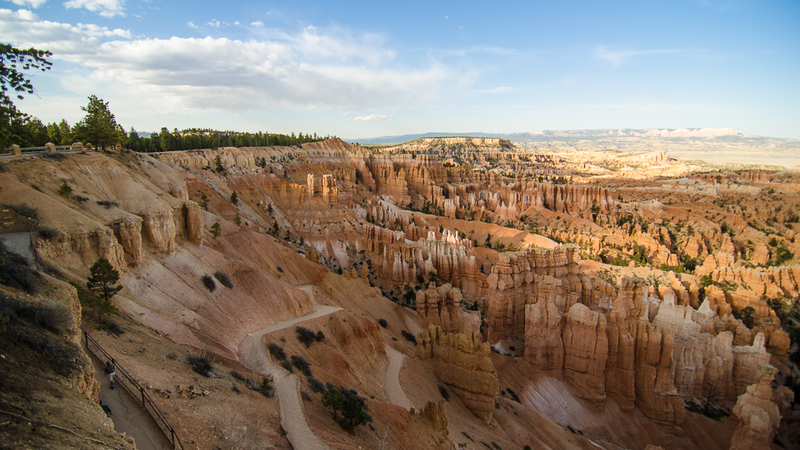 Looking down at the hoodoo formations in Bryce Canyon, National Park. A lone straggler walking up the pathway before sunset. Then it was back to our hotel for dinner and a much-needed rest. 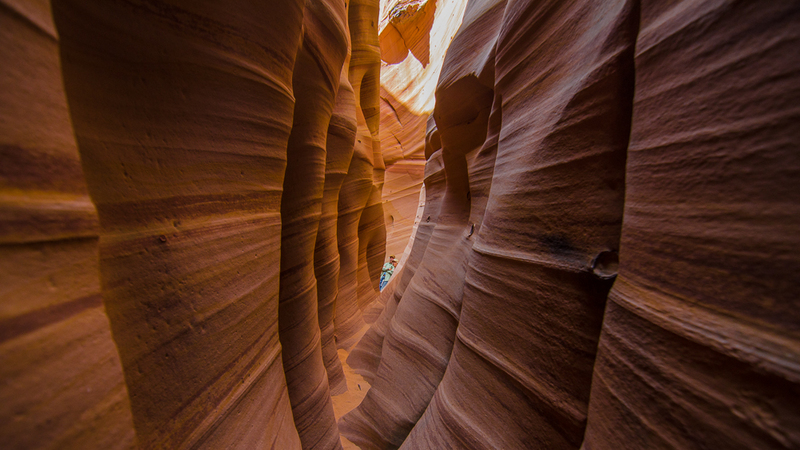 We drove along highway 12 into the Grand-Staircase Escalante National Monument and did a little backcountry drive to a lesser-known hike to Zebra Slot Canyon. The hike was a little over 5 miles roundtrip on mostly-flat ground. We reached the canyon after an hour under direct sun. The cool canyon walls provided a nice respite. 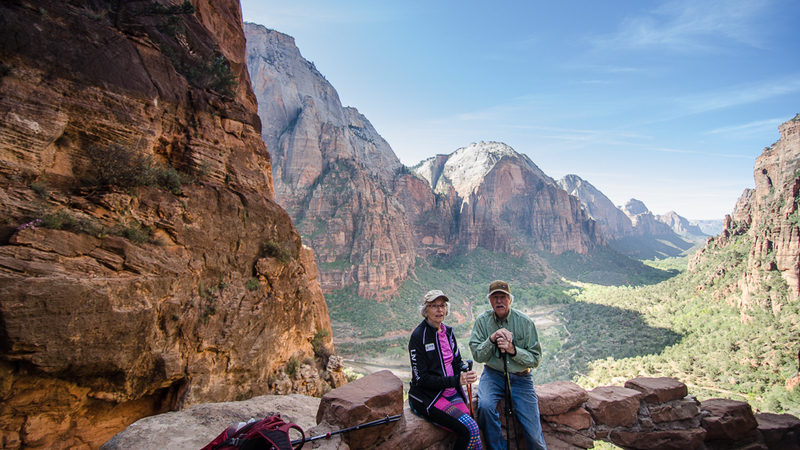 Parents resting in the cool canyon shade before our hike back though the desert. The drive through Grand-Staircase Escalante National Monument is an especially pretty one, as is the rest of the drive up the 24 towards Canyonlands. 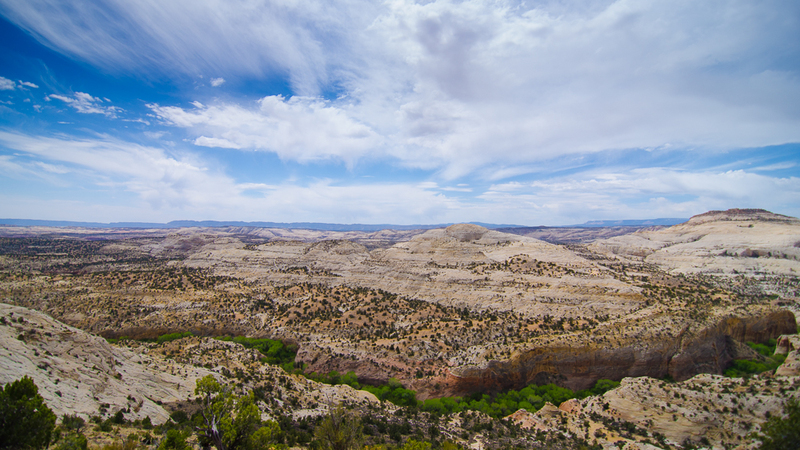 An overlook in Grand-Staircase Escalante National Monument. 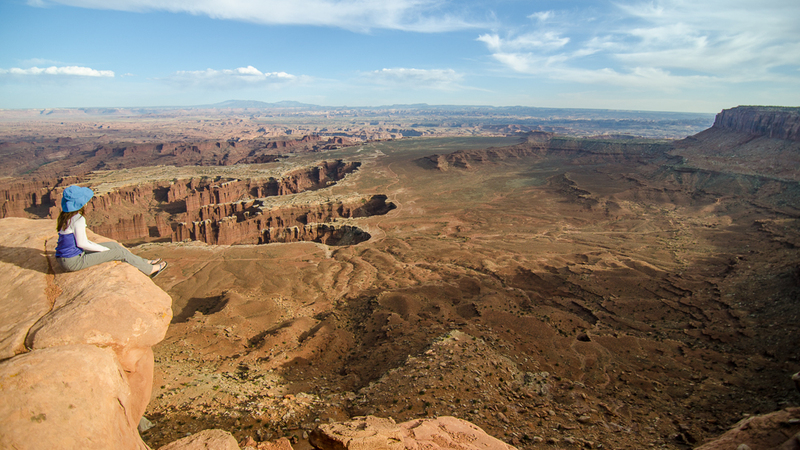 Around 5pm, we reached Canyonlands National Park and made our way out to the main lookout at the tip. Canyonlands is the biggest National Park in Utah and covers 527 square miles. The canyon was formed over the years by the Colorado and Green river, both of which combine in the center of the park. 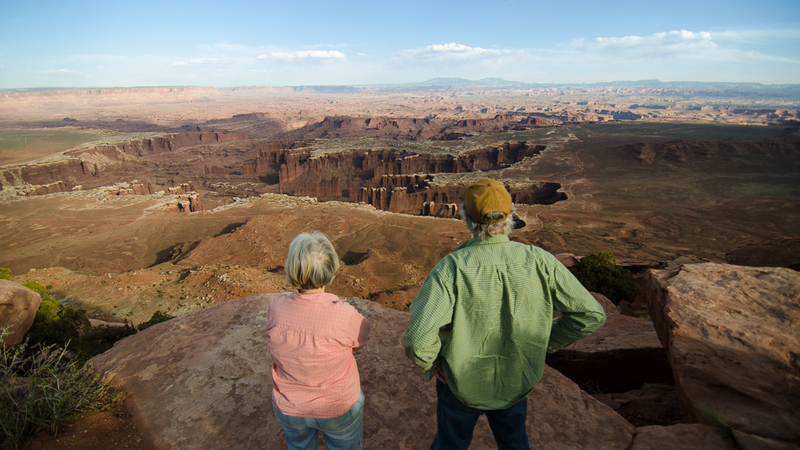 Parents enjoying the view at Canyonlands National Park. Ms. Fool found a spot for contemplation. Once the sun started going down, we got back in the car and continued driving to Moab for the night. Having been to Arches before, we Fools wanted to beat the heat and the summer crowds. So in the morning we booked it to the trailhead for Delicate Arch. The hike isn’t bad: roughly 3 miles and 480 feet of elevation gain. 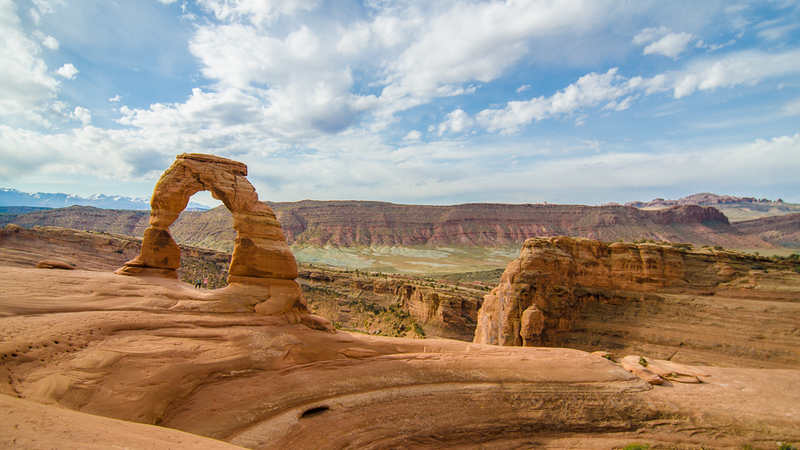 Delicate Arch sits 46 feet high and 32 feet wide. It is the largest freestanding arch in the park. Hard to see, but Mr. Fool’s parents are under the arch waving. After hiking to Delicate Arch, we got back in the car and drove around to a few of the other areas inside the park. 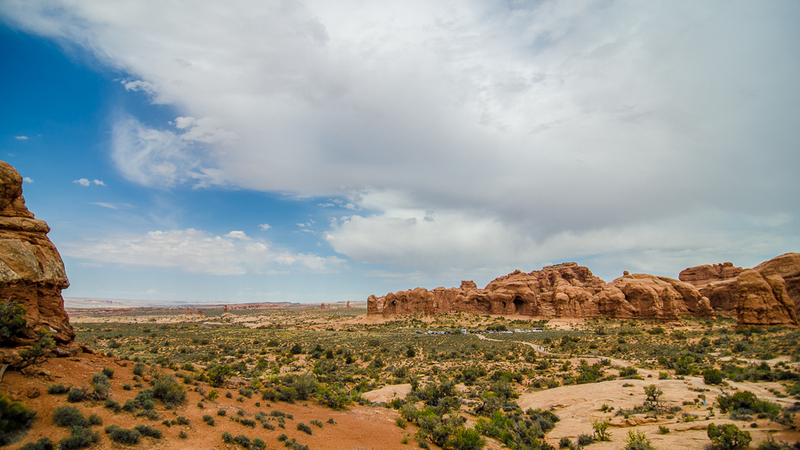 Parade of Elephants in Arches National Park. The main elephant is in the center of the photograph. 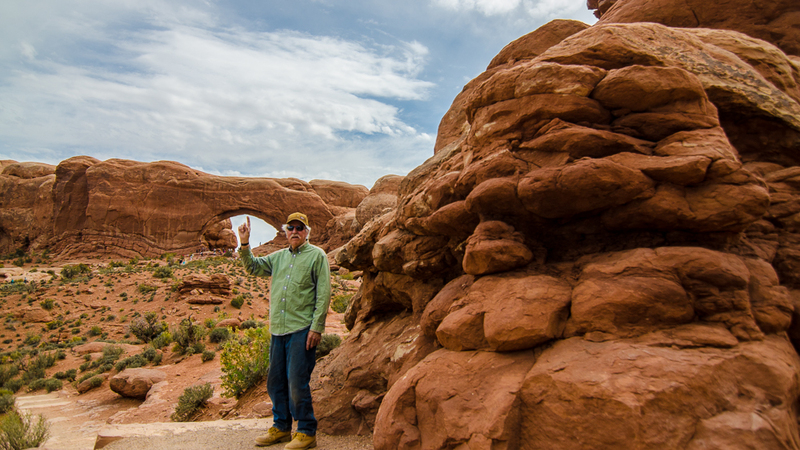 Mr. Fool’s dad supporting the North Window arch. 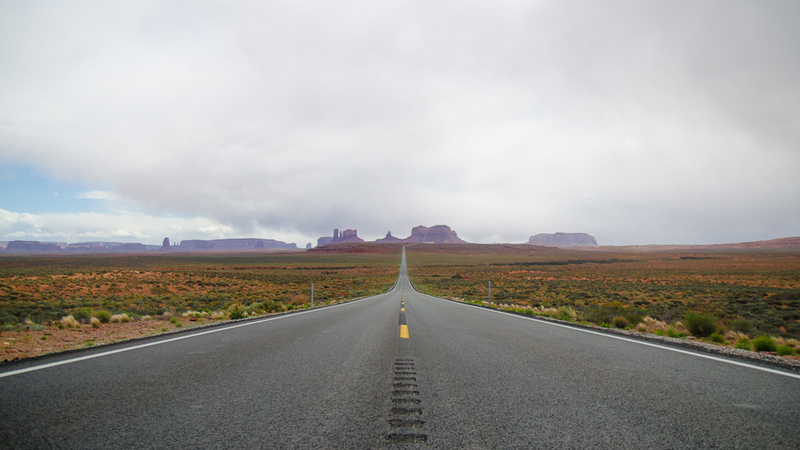 Once we had our fill of Arches, we drove down the 163 though Monument Valley and then headed up the 98 towards Page, Arizona. 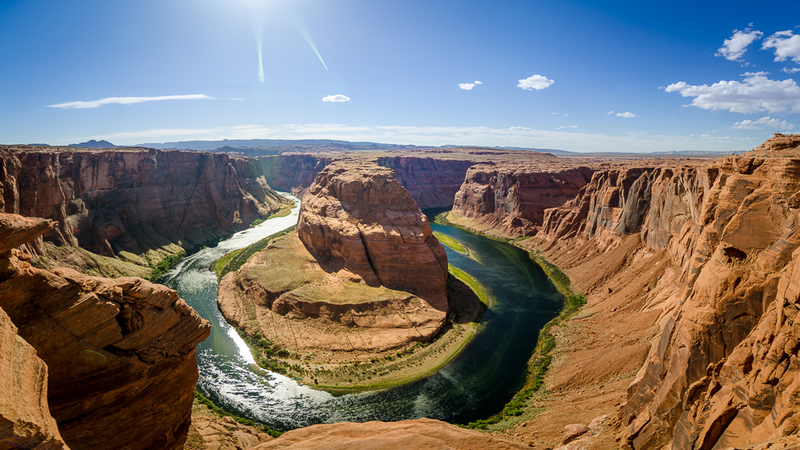 Our destination: Horseshoe Bend, another amazing feature along the Colorado River. View from the top of Horseshoe Bend. The final day of our trip, we stopped at the mother of all canyons: the Grand Canyon. 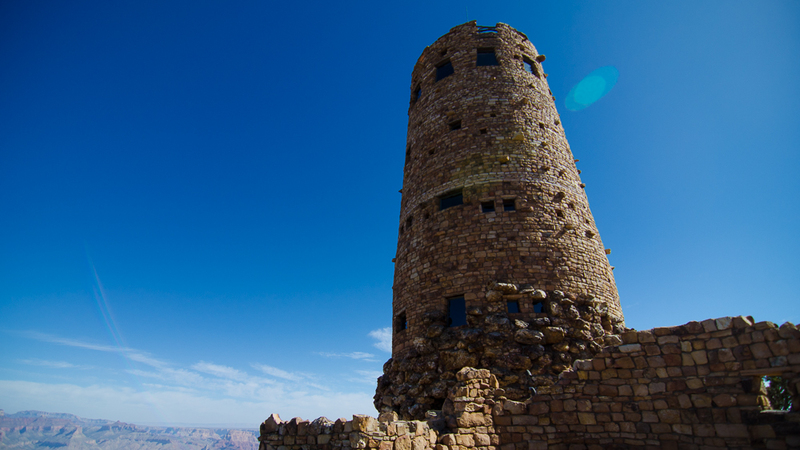 Our first stop in the park was Mary Colter’s Desert View Watchtower. Mary Colter’s Desert View Watchtower. Then we dropped the car at Grand Canyon Village and walked the rim. 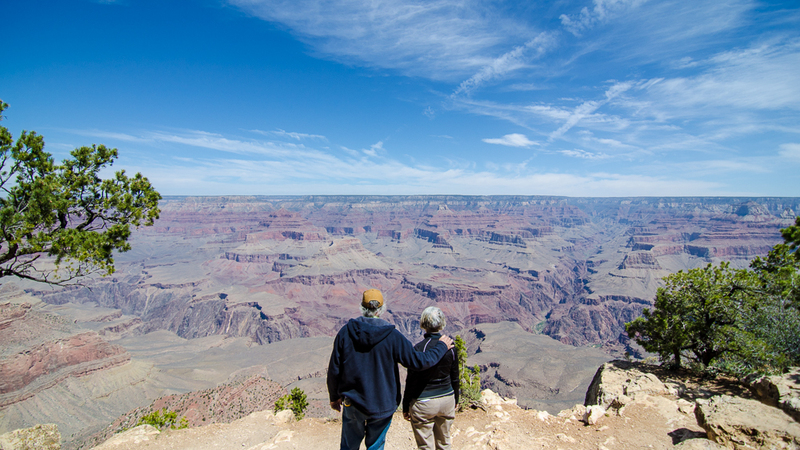 Mr. Fool’s parents taking in the full view of the Grand Canyon. After several hours of oohing and ahhing, we drove back to L.A.
Our trip covered roughly 2,000 miles. 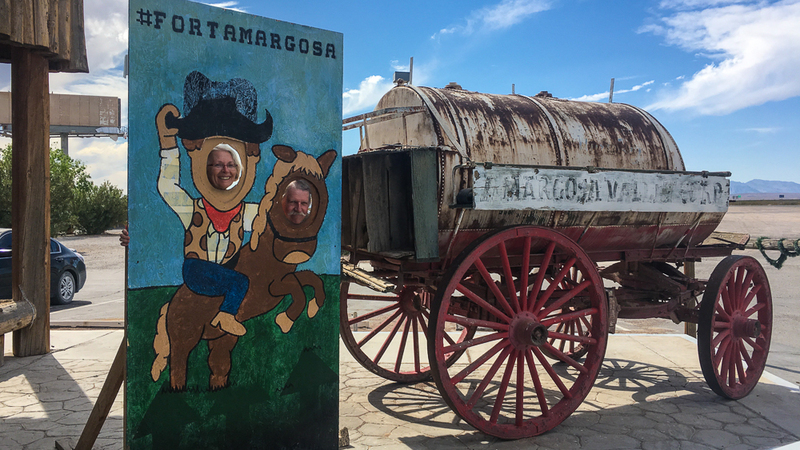 We were so glad to share some of the best parts of our corner of the country with our family!